Barry Strauss's Ten Caesars is the story of the Roman Empire from rise to reinvention, from Augustus, who founded the empire, to Constantine, who made it Christian and moved the capital east to Constantinople. In the imperial era Roman women--mothers, wives, mistresses--had substantial influence over the emperors, and Strauss also profiles the most important among them, from Livia, Augustus's wife, to Helena, Constantine's mother. But even women in the imperial family faced limits and the emperors often forced them to marry or divorce for purely political reasons. Rome's legacy remains today in so many ways, from language, law, and architecture to the seat of the Roman Catholic Church. Strauss examines this enduring heritage through the lives of the men who shaped it: Augustus, Tiberius, Nero, Vespasian, Trajan, Hadrian, Marcus Aurelius, Septimius Severus, Diocletian and Constantine. Over the ages, they learned to maintain the family business--the government of an empire--by adapting when necessary and always persevering no matter the cost. 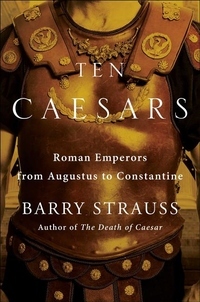 Ten Caesars is essential history as well as fascinating biography.